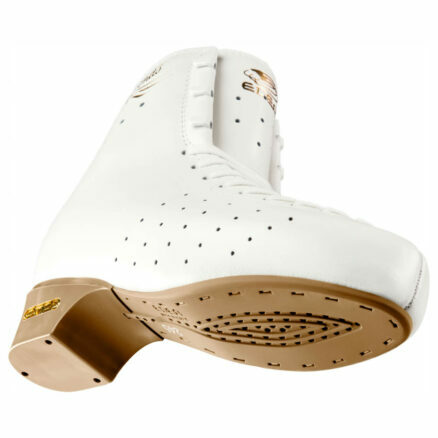 EDEA “NOENE” Anti-Shock UnderSoles – Skates U.S.
EDEA presents the world's first Shock Absorbing UnderSole for Skaters (both Ice and Roller) since 2011 – and All other foot impact sports! The competition among Skaters is becoming more intense, with more Skaters performing at ever younger ages, more Jumps, harder Jumps, and Jump Combinations. The training intensity due to the repeated impact of the landings can lead to additional stress in the feet, ankles, knees, hips, spine, neck, and even to the base of the skull. Tests have shown that the impact of landing Jumps is 7 to 8 times your body weight. 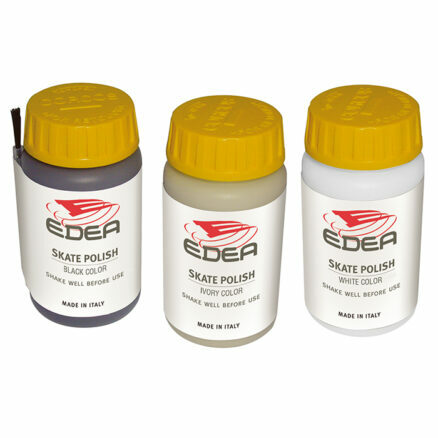 EDEA through SkatesUS.com , has since 2011 been providing this magical solution that actually absorbs, diffuses, and disperses 43% (for one layer and 63% for 2 layers) of the shock and impact vibrations of landing jumps from injuring key parts of the body. Many of the top level Skaters have been using this technology for years to enhance their performance and jumping abilities while reducing the potential of impact related short and long term injuries. “NOENE” Anti-Shock Technology, a Swiss technology is being employed by EDEA to absorb, diffuse, disperse and effectively reduce up to 63% of the SHOCK and IMPACT from the heel to the head. At the molecular level, the “NOENE” material is taking the vertical impact and dispersing it horizontally, away from the body by it’s viscoelasticity properties. 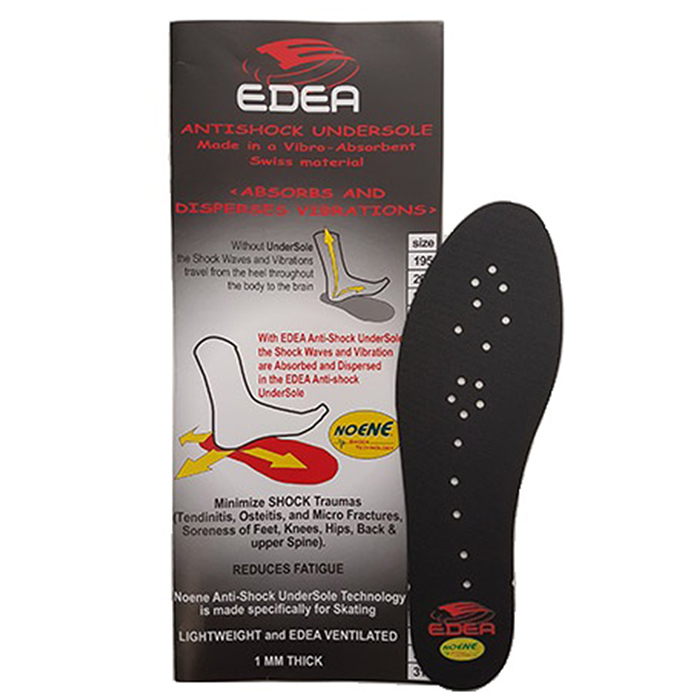 EDEA “NOENE” Anti-Shock Technology UnderSoles are a Class 1 Medical device, only an extra thin 1mm thick and ultra-light 13 grams of weight (in size 280, approx a mens size 9), and are to be installed under the EDEA Anatomic InnerSole or custom orthotic innersoles. They can be easily hand washed with soap and lukewarm water and a sponge. The guarantee is 1 year. This very thin EDEA Anti-Shock UnderSole will provide the shock absorption, diffusion, and dispertion qualities for which “NOENE” is famous. The Skater’s instrument is worth gold, help to take care of it. 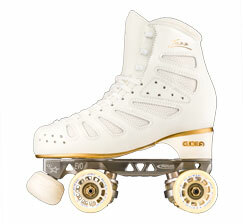 Sizes are in EDEA Skates centimeter sizing (195 through 310). 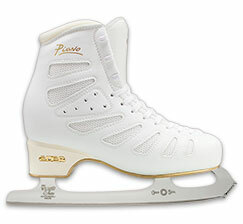 Please contact OrderDesk@SkatesUS.com or call the shop at (765) 935-7477 to order. 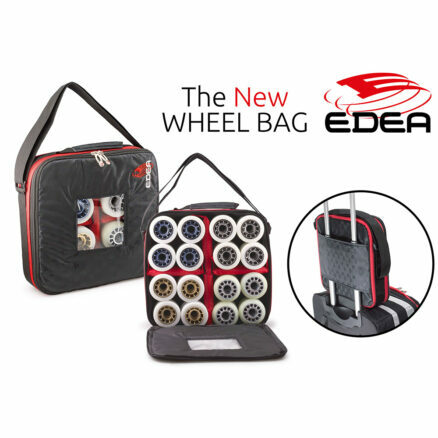 Read more about the new Anti-Shock system, featured in the EDEA 2017 catalog. Click each image to view larger.